Have you stumbled across a QuiBids Promo Code for Free Bids? We’re always posting Promo Codes (also called Coupon Codes) on social media, our email newsletter, and even here on the blog. Every time we post a new one, we’ll get one or two customers asking us where they should go to claim the code. Since this question seems to be a popular one, we decided to take the time to put these 5 simple steps in a blog post. Follow the directions below to redeem your Promo Code. Once you get your bids, leave a comment at the bottom of the post to let us know if the code worked for you. 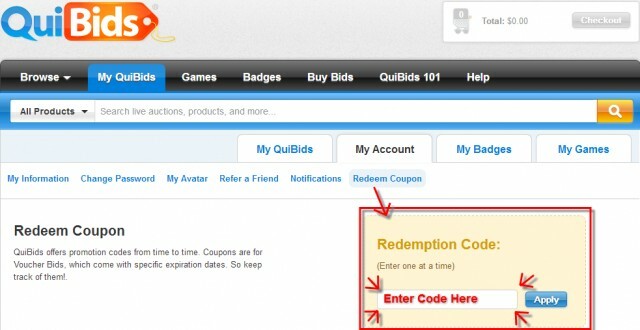 How do I redeem a QuiBids Promo Code? As always, your first step after arriving at QuiBids.com should be to log in with your QuiBids username and password you created when you first signed up. If you haven’t made an account on QuiBids, then now’s your chance! Just click here to sign up and start saving! 2) Go to My QuiBids. My QuiBids is your centralized hub for all things QuiBids. Here you can connect with QuiBids on Social Media, claim a badge, view your bidding/purchase history, view your Watchlist and much more! You can learn ways to get the most out of My QuiBids by going here. Under the My Account section of My QuiBids, you can update your profile and email preferences, change your password or avatar, refer a friend for Free Bids, in addition to redeeming a Coupon Code. This is pretty self-explanatory. Just click on the Redeem Coupon link under the tabs in My QuiBids. Refer to image above. After clicking the Redeem Coupon link, you’ll be taken to a screen similar to the above image. Enter the Code in the text bar inside the yellow box and click Apply. If you have more than one code, enter each individual code separately. Each Promo Code will come with an expiration date and must be applied by that particular date. Promo Codes are for Voucher Bids only. Free Bids from Coupon Codes are only valid for a limited period of time. You must have purchased the starter bid package to be eligible to redeem promo codes. Did it work? Let us know in the comments below!